Cedar Fair, the company that owns and operates some of the greatest amusement parks in the world including Knotts Berry Farm and the roller coaster capital of the world, Cedar Point, has announced $62 million in new attractions, roller coasters and family rides to debut in 2009. 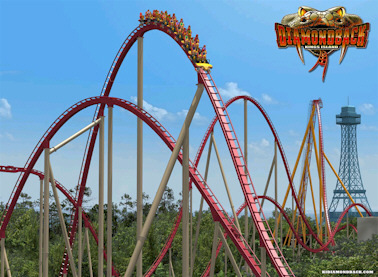 The highlight of the 2009 capital program will be Diamondback, a $22 million roller coaster built by Bolliger & Mabillard that will rise above the landscape at Kings Island in Cincinnati. Diamondback will be a true steel serpent, snaking through the midways, slithering between existing attractions and navigating the unique hills and ravines that surround the park. Riders will board open-air trains that feature unobstructed views of the coaster’s track (this is the first time trains of this nature will be used in the U.S.). After cresting the 230-foot-tall lift hill, the trains will dive to the ground and encounter hills, banked turns and generous amounts of “airtime,” adding to the scales of Diamondback’s massive layout. Diamondback will be one of the largest single investments in Kings Island’s 36-year history. In addition to Diamondback, two additional thrill-inducing animals will stake their claim within the Cedar Fair family of parks in 2009. 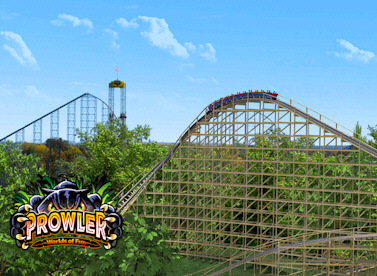 Worlds of Fun in Kansas City, Missouri will debut of Prowler, a Great Coasters International wooden coaster that will carve a tangled path in the park’s wooded terrain. The two-and-a-half minute high speed chase begins with the ride’s only feature above the trees’ cover, a swooping 85 foot plummet into a ravine. After the spiral plunge, the train rips through a seemingly endless amount of high speed hills and sharply banked turns that hug the wooded land below. With a top speed of 51 mph, riders grasped in the clutches of Prowler carve a path with powerful but smooth changes of direction, speed, and elevation. Along with the addition of the new roller coasters at Kings Island, Worlds of Fun and Carowinds, a new wave of fun will lap the shores of the newly-named Soak City Water Park at Valleyfair in Shakopee, Minnesota. Breakers Bay, a 350,000-gallon wave pool will feature the waves and action of the ocean in a safe environment. Guests will have access to private cabanas, a new bathhouse and new food and merchandise options. At Kings Dominion in Doswell, Virginia, two new family rides will debut in the Grove section of the park next summer. The Americana Ferris wheel and the El Dorado rotating car ride are sure to help families create new memories. Finally, several parks will debut a variety of exciting live shows, including a brand-new ice-skating show at Dorney Park, and the expansion of the “All Wheels Extreme” stunt show, featuring BMX-style bikers, skateboarders, gymnasts and in-line skaters, to several properties. Cedar Fair Entertainment Company (NYSE: “FUN”) is a publicly traded partnership headquartered in Sandusky, Ohio. The Company, which owns and operates eleven amusement parks, six outdoor water parks, one indoor water park and five hotels, is one of the largest regional amusement park operators in the world. Its parks are located in Ohio, California, North Carolina, Virginia / District of Columbia, Pennsylvania, Minnesota, Missouri, Michigan, and Toronto, Ontario. Cedar Fair also operates the Gilroy Gardens Family Theme Park in Gilroy, California under a management contract. Cedar Fair’s flagship park, Cedar Point, has been voted the “Best Amusement Park in the World” for eleven consecutive years in a prestigious annual poll conducted by Amusement Today newspaper. Related: Book your dream Cedar Point vacation at Expedia.com!